The summer is almost over and the football season is now in full swing around the world and if you want to deliver your very best, then now is the time to have your gear in order. We have packed the bags for the start of the season. The summer holidays are over and it's back to everyday life. This also means it's time to get your boots back on and be ready for the new season. No more trips to the beach, no more sun, no more Confederations Cup, no more relaxing in the garden. Now it's all about working hard to get better and bring more success to your team. This can only done with the right gear and we have therefore packed the big bag, so you can be ready for the new season. 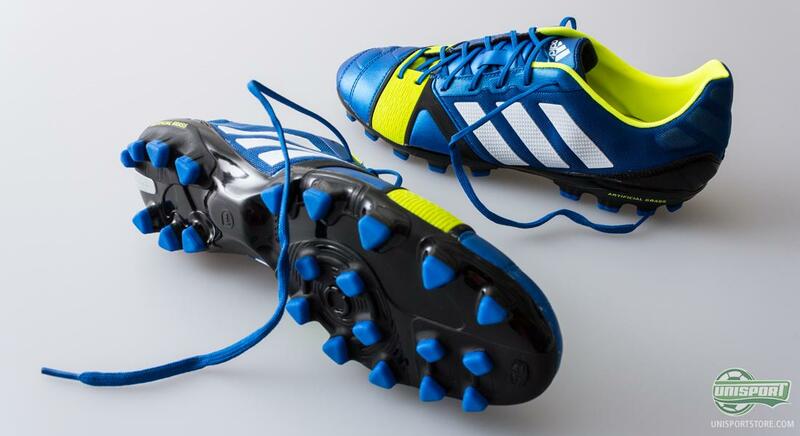 If you are going into the new football season, but your boots are looking a little worse for wear, then it may be time to look for a new pair. We have therefore packed the brand new Nike Hypervenom Phantom, which is Nike's latest silo, which was unleashed on the football world in May. The boot is made with Nike special NikeSkin, which adapts itself to your foots shape, which means even people with wide feet can wear them. And to make sure you don't slide around in your boots, we have naturally packed a pair of Trusox. Should you have the need for playing on artificial grass, then you can't be using your Hypervenoms with FG-studs, as that would apply pressure on your knee and other joints. Therefore we have also packed the new Adidas silo. We will be ready for action on artificial grass with the new Adidas Nitrocharge 1.0 AG, which is meant for the player, who never stops running, also referred to as #TheEngine. It has the Energysling on the front foot, which lets you get the most out of your efforts, when running. The boot comes in both green and black, on top of this colourway, but we have still gone for the launch colour version of the boot. It is not just important to have the right boots. It is also necessary to make sure your shins are kept safe, when a Nemanja Vidic-like defender comes storming in with a sliding tackle. Shin pads are a no-brainer and with the Nike Mercurial Lite we have packed a shin pad that is both light and offers good protection. 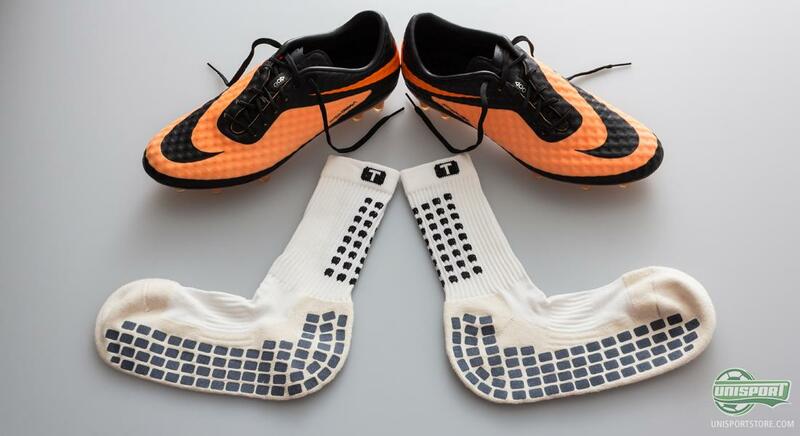 Just to be safe we have also added the Nike Ankle guards, so all areas of your foot are covered. 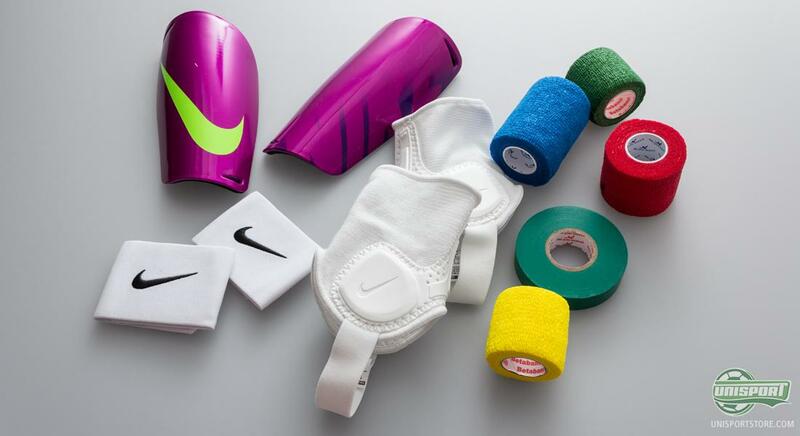 Shin pads are however little use if they are just sliding around everywhere, so to stop that we have the Premier Sock Tape, which is the preferred sock tape in 13 Premier League clubs, so its credentials are in order. 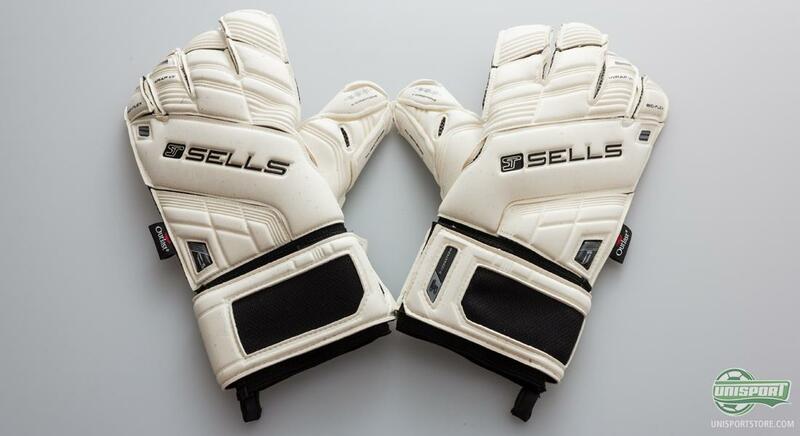 Are you instead the last line of defence, the goalkeeper, who stands at the back yelling and occasionally pulling off a save or two, then you always need a pair of goalkeepers gloves. Therefore we have added the awesome Sells Wrap Elite VII Elite Exosphere to the bag. The glove is made with the Adhesion Ultra Absolute latex, which is 4 mm thick and Sells pride themselves on the gloves ability of being great in all weather conditions. At the same time there are the Bioflex zones on the glove, as well as it having a rollfinger cut, so you are ensured a glove that never has a bad day. No matter whether you are on goal, or out in the field of play working, then you need to dress to impress. 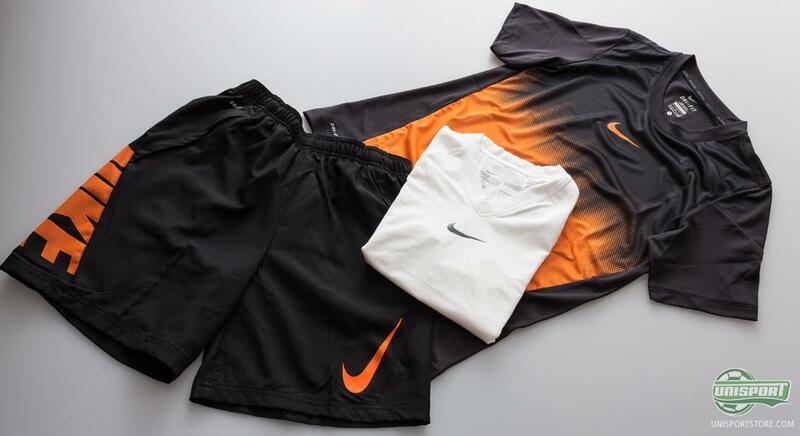 You need to feel comfortable and here the Nike Hypervenom T-shirt and Nike Hypervenom Shorts are perfect, as they ensure a nice fit and excellent sweat transportation. 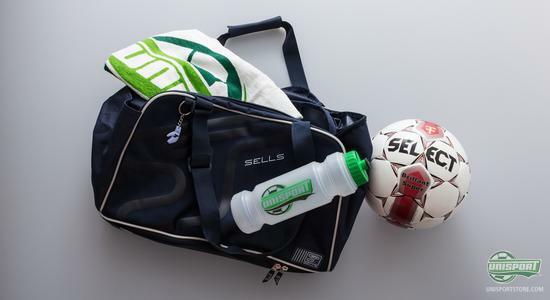 We have therefore added them to our now bulging sports bag, as well as the Nike Hypercool base layer, which gives a constant and comfortable body temperature, diverting sweat away from your body, even when you are going at full throttle. It is no longer enough to dress well during training, but also before and after. If you want to be one step ahead of your opponent, it is a good idea to pull out your running shoes before training and we have therefore packed the cool Nike Lunarglide 5+. They give amazing shock absorbency, thanks to the Lunarlon sole. After training it's time to shower, but as we all know changing rooms are seldom nice places to place your bare feet in. Solution? 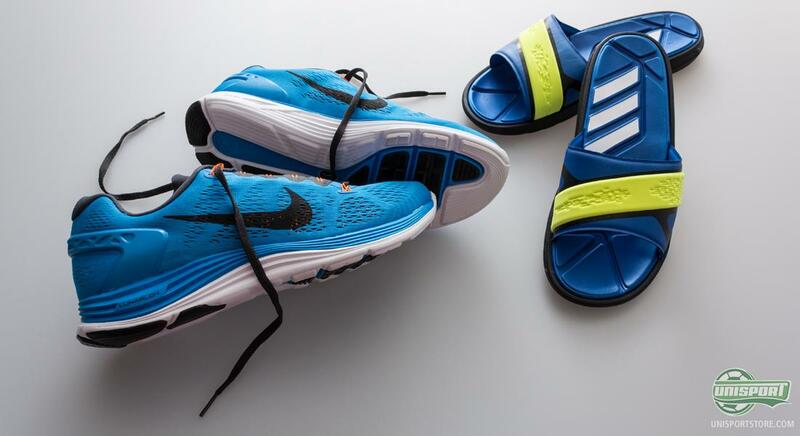 A pair of Adidas Nitrocharge slides in the bag, which look like it's 'older brother' known from the pitch, with a nice strap across the forefoot similar to the Energysling, to keep bacteria and other dirt away from your most important tool. Now, if you want to be well prepared you also want to have some clothes for when the weather is not as pleasant. The autumn is not that far away, and that is often equals stronger winds and even rain. Therefore, we have also included the super nice Puma Windbreaker in the bag. It is produced from 100% polyester and is also equipped with a zip, thus enabling you to get in some air if you are getting a little too warm. 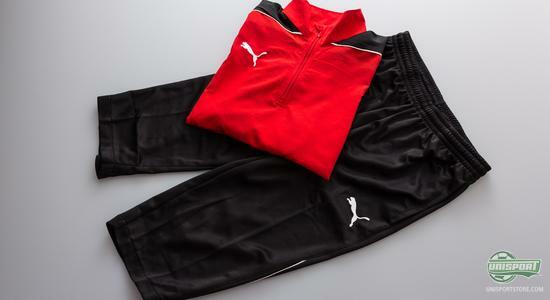 It is also important to keep your legs warm, and therefore you will also find a pair of Puma Knickers, which, on top of being warm, are also comfortable and provide good freedom of movement. Now that we have stuffed all of these great items into the bag, it is of course important to have a good bag that can carry it all. With the new Sells Bag  Supreme Navy you will have great space and even a separate compartment for your boots. It is important to drink a lot of water, and therefore we have also added a drinks bottle with our Unisport logo, to make sure that we do not forget where we are coming from. Forgetting where we are coming from shouldn't become an issue as we have also added our popular towel, also with the Unisport logo. To finish off, we can of course not forget maybe the most important item. Without a ball, it is going to get rather hard to play football, and therefore we have also included the classic top model from Select, the great Super Brillant. It's all about being well prepared, and we believe that we are just that with our start-of-season bag. Which of the items from the bag would be your first pick? And do you think we have forgotten anything? Feel free to share your thoughts and comments in the box below, or on Facebook and Twitter.